Search Results for "picture book"
Cheerful preschool asian girl with mixed race teacher learning and reading children's picture book in kindergarten class while cute caucasian little girl playing with colorful construction toy blocks. Lake Cuyamaca - Julian, CA - Drone Video Aerial Video, about an hour's drive from San Diego, Lake Cuyamaca is a picture-book 110 acre lake that is proof positive that good things come in small packages. Opening Book with blank white pages. 1970s: Library. 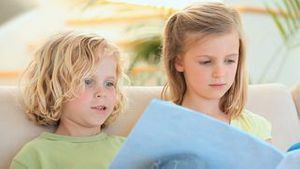 Children look through picture book. Hand points to map with pencil. Family checks out books and films. Four children lying on the floor and reading together. 1950s: Picture book with rabbit. Rabbit sitting beneath tree in forest. Tree leaves and sky. Rabbit close up. Rabbit in forest. 1950s: Teacher in classroom with children. Teacher reads from picture book about rabbit. 1950s: Girl reads picture book. Woman walks into building. Girls and boys work at tables. Woman walks from table to table. 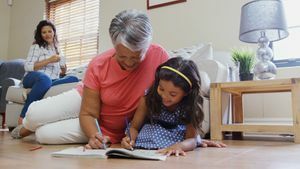 A grandparent is reading a story book to his granddaughter and grandson. The grandson is dressed up as a princess from the story in the gender blender style. Shot in super slow motion at 240fps. Shot in a modern British house. A grandparent is reading a story book to his grandson. The grandson is dressed up as a princess from the story in the gender blender style. Shot in super slow motion at 240fps. Shot in a modern British house. Pregnant woman in a blue dress is lying on the bed and leafing through a children's book. Children's picture book in the hands of the expectant mother. 1960s: Map of ancient Roman empire. Child flips pages in ABC book. This slow motion video shows a cute italian greyhound dog in a fun colorful outfit flipping through the pages of a big book. 1940s: UNITED STATES: Agriculture department title. Hand flicks through picture book of farm animals. What is education title. 1945 - Refugees, including a mother cuddling her baby as her daughter looks at a picture book, settle in in a home in Cummington, Massachusetts. This video shows a cute italian greyhound dog in a fun colorful outfit flipping through the pages of a big book. 3 year old girl at the kitchen table flips through picture book. 1958 - A First Sergeant is greeted by his wife and children and he goes through his mail, reads a book, listens to his daughter play the piano and prays with his family before a sharing a meal in a home in Berlin, Germany.